I’m sure I wasn’t the only person who thought the new camera off-set options added in Guild Wars 2‘s latest patch made an odd addition to a tab-targeted game, and now we know why: coming in Heart of Thorns, the team at ArenaNet will introduce a massive addition of new options set to revolutionize the way the game is played, with options expanding to include the existing tab-targeting system, as well as soft-locking and a full on skill-shot only mode more akin to Skyrim than most MMOs, with other new game-changing targeting options to boot. Initially, a tab-targeted game promising to add action targeting ranked pretty high on my personal skepticism metric. I expected something half baked and akin to The Secret World’s tacked on reticle mode, but after watching the full presentation (linked below), it didn’t take long for me to be converted to total believer status. 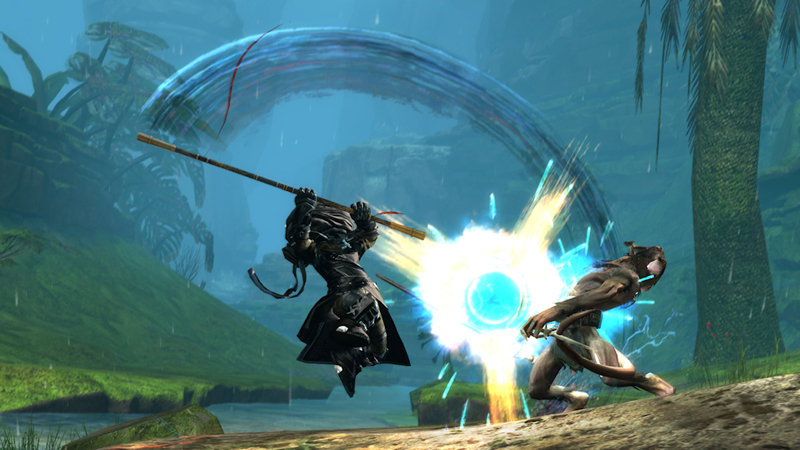 When these changes are implemented, Guild Wars 2 will have one of the most robust and highly adaptable targeting systems on the market today. The new targeting system, “Action Camera Mode”, is a reticle-look mode which locks the camera to a minimalist white dot on the center of the screen after enabling the mode via a bindable toggle. When mousing over a target, the cross-hair expands to indicate that they can be attacked. While Action Camera Mode is enabled, player movement is modified so that pressing the key to move backward left or right physically turns the character to move at full speed, rather than backpedaling slowly as it does in the current targeting mode. In line with other action RPGs, the first weapon skill (the auto-attack chain for those weapons which have one) will fire when pressing the left-mouse buttons. Projectiles will be fired directly at the cross-hair in 3 full dimensions; aiming up and down will send the projectile up into the sky or down into the ground depending on where you’re aiming. There is an auto-targeting option already in game; with this enabled, attacks will soft-lock onto the enemy you have targeted, as indicated by a new targeting circle that appears around the target’s feet (basically mouse-over targeting). With auto-targeting disabled, attacks will be fully untargeted skill-shots fired directly at where the player is aiming. Then there are going to be people who are like, ‘that’s nice’, but what they really would like to do is play Skyrim again. Skyrim does not really have auto-targeting. So what we’re going to do is just turn it off. So now nothing locks. Right clicking while in Action Camera Mode will lock the currently highlighted target to provide a larger targeting window to hit that specific target. This function appears to be similar to The Elder Scrolls Online‘s target-lock initiated by hitting the tab key. This can also be used to lock a target while auto-targeting is disabled in the settings. Horizontal and vertical camera off-set features are already in-game to tweak where the reticle is placed on-screen in relation to the character model. If you want over the shoulder, you can use that. If you want it directly behind the character, you can do that as well. Engineers, who have long suffered usability issues with their grenade kit, will be able to enable instant ground targeting and the new Action Camera Mode in combination to simply hold down left click to repeatedly fire their first grenade skill at the reticle (this was demonstrated during the stream). With the soft-lock enabled, an additional snap-to-target feature for ground targeted AoEs will allow players to cast AoEs directly at their target’s feet simply by mousing over them, instead of having to aim the reticle down at ground beneath them. There is a new option to enable re-targeting mid-cast, so that a cast can be continued on a new target if the original dies or if you simply change your mind about who you want to hit. This functionality will apply to switching targets mid-cast for multi-hit channeled skills like the Ranger longbow #2 skill. If you’re a Guild Wars 2 player or someone whose interest has been piqued by the announcement, you’re doing yourself a massive disservice if you don’t swing by the official presentation linked below to check it all out in action for yourself. While the options sound great on paper, they appear to actually deliver in game as well. For me at least, this new functionality really is a game changer.